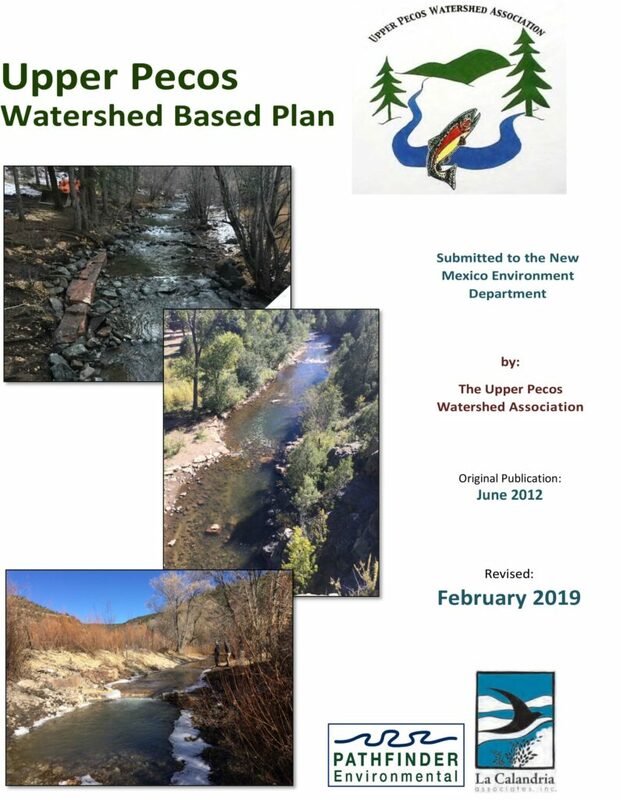 The Upper Pecos Watershed Association is proud to announce the completion and release of our updated Watershed Based Plan 2019. 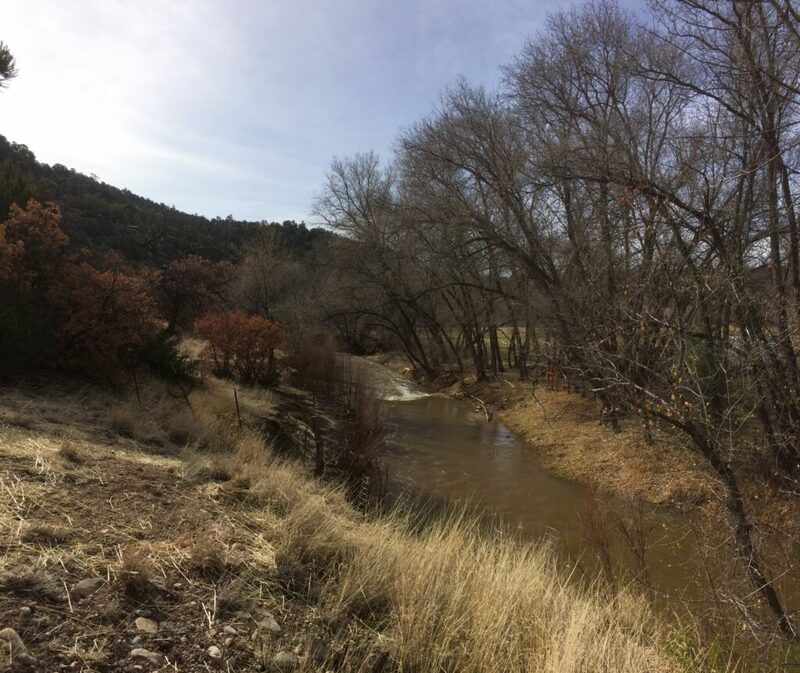 In 2016, the Upper Pecos Watershed Association (UPWA) received a grant from the U.S. Environmental Protection Agency (EPA) through the New Mexico Environment Department’s (NMED’s) Surface Water Quality Bureau (SWQB) to update their Watershed-Based Plan (WBP). 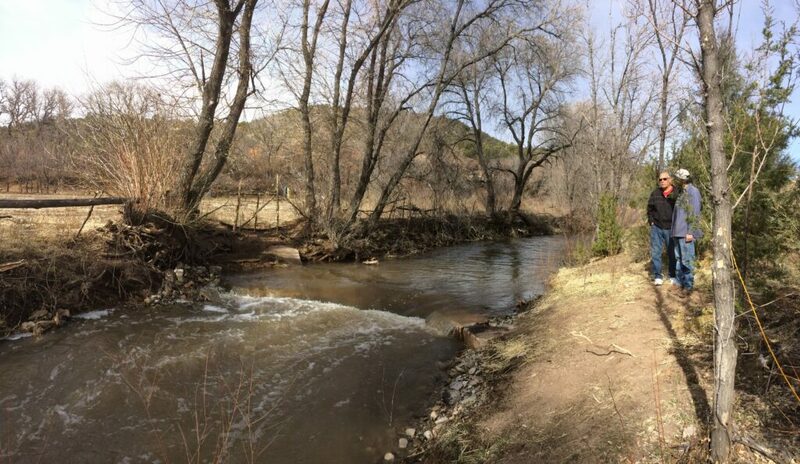 This update was extensively revised and includes new implementation projects and discussion of the effects of two major wildfires that occurred in the watershed in 2013. It also includes updates and revisions to other sections of the original plan released in 2012. 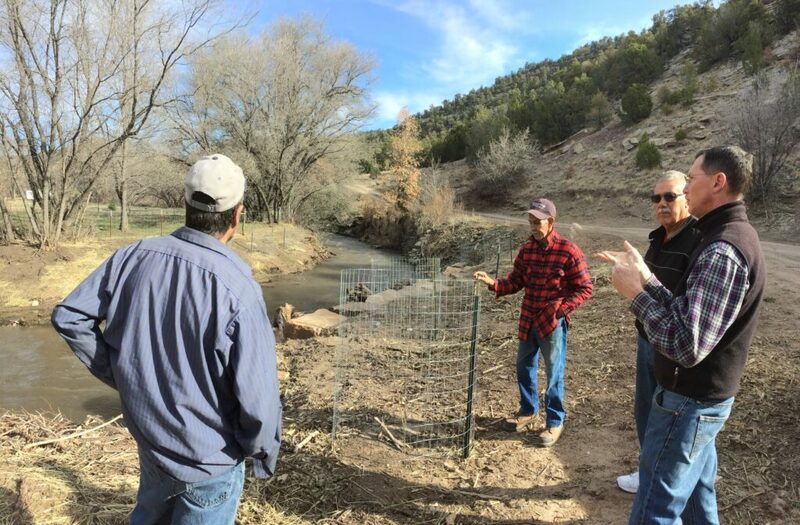 The Upper Pecos Watershed Association project team held another landowner’s field workshop at our Lower Cow Creek restoration project in North San Ysidro, NM. 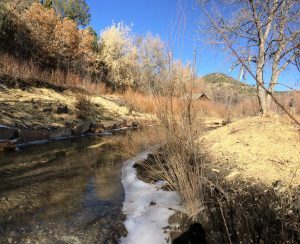 Since our last field trip in early March, the snow has started to melt and the creek was up a bit. 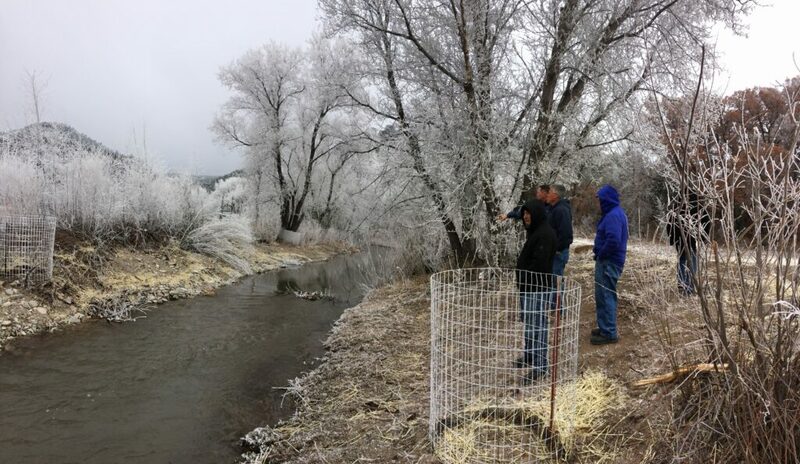 For the first time since construction we were able to observe how the restoration work is performing under higher flows. We have one more group that we’ll meet with late Wednesday afternoon, April 3rd. 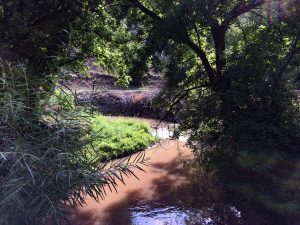 The Lower Cow Creek project in North San Ysidro is our first EPA Clean Water Act 319 (h) project done on private property. As a part of ensuring that the project work has a sustained beneficial impact, UPWA is organizing a series of post-construction field workshops with the landowners. 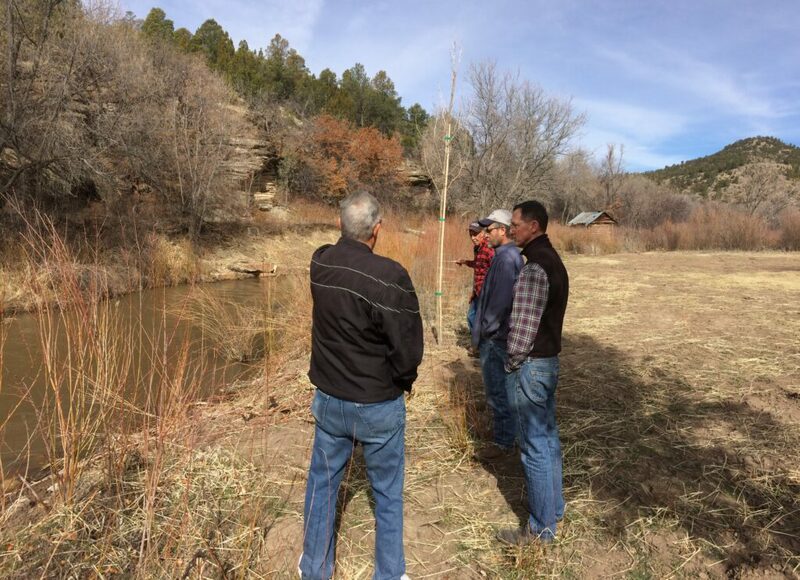 The intention of of the workshop is to provide a review of the work that was done and teach methods that the landowners can use to prevent some of the problems that were repaired. 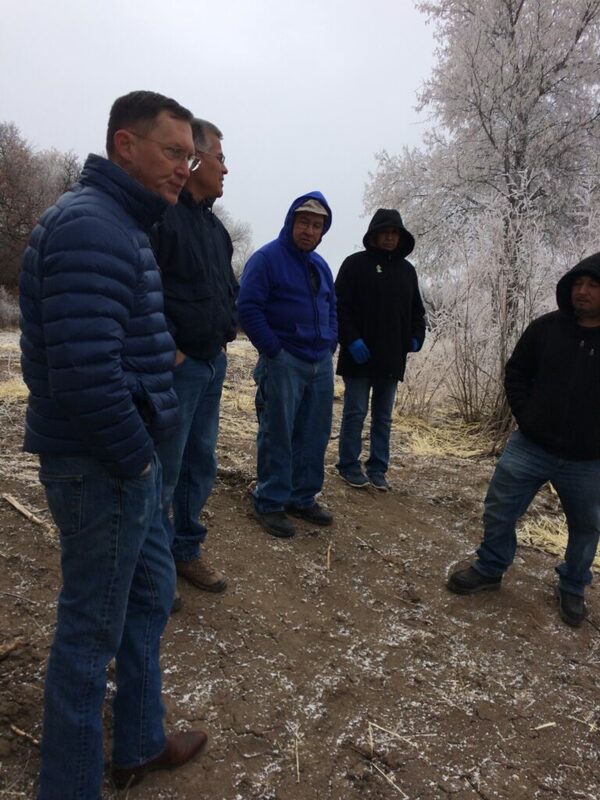 On the cold morning of March 4th, between snowfalls, we had our first meeting with four landowners. UPWA project manager David Lemke and Pathfinder Environmental technical consultant led the discussion. Everyone was pleased with the results. 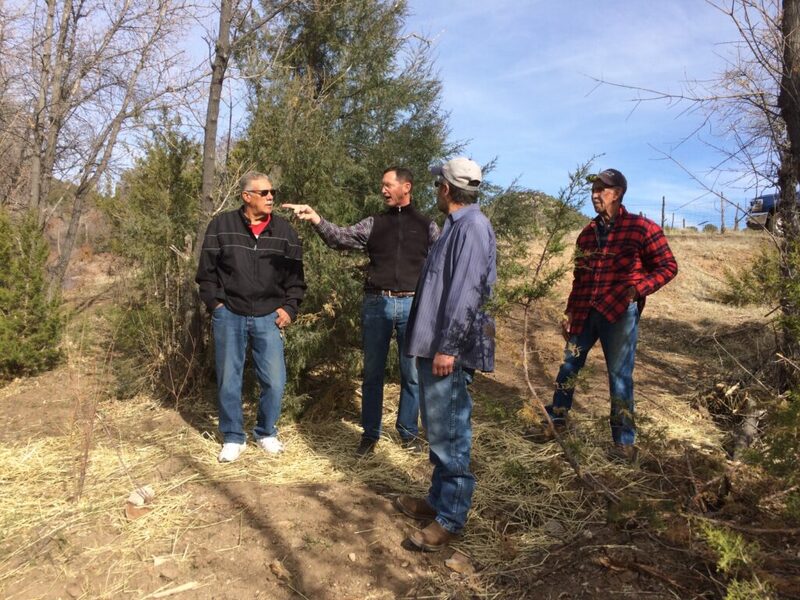 Landowners in attendance were John Michels, Leroy, Patsy and Isidro Gonzales. 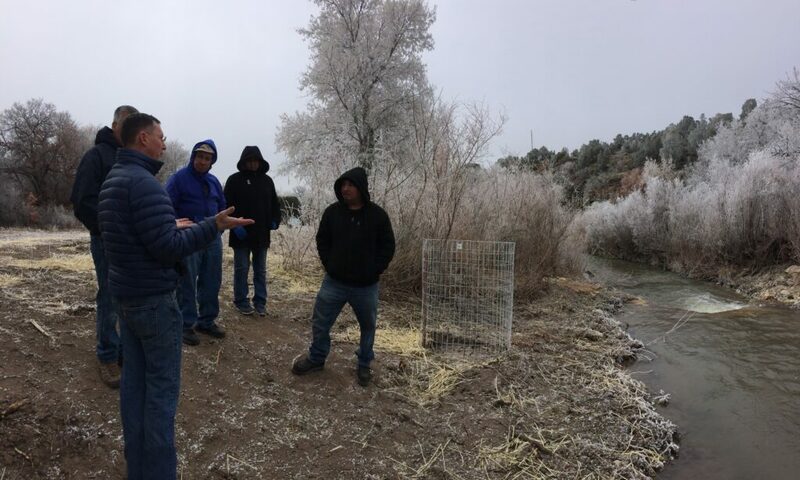 We discussed the technical aspects of the constructed in-stream structures, explaining how they are self-scouring to help maintain cool water temperatures and reduce the accumulation of sediment. 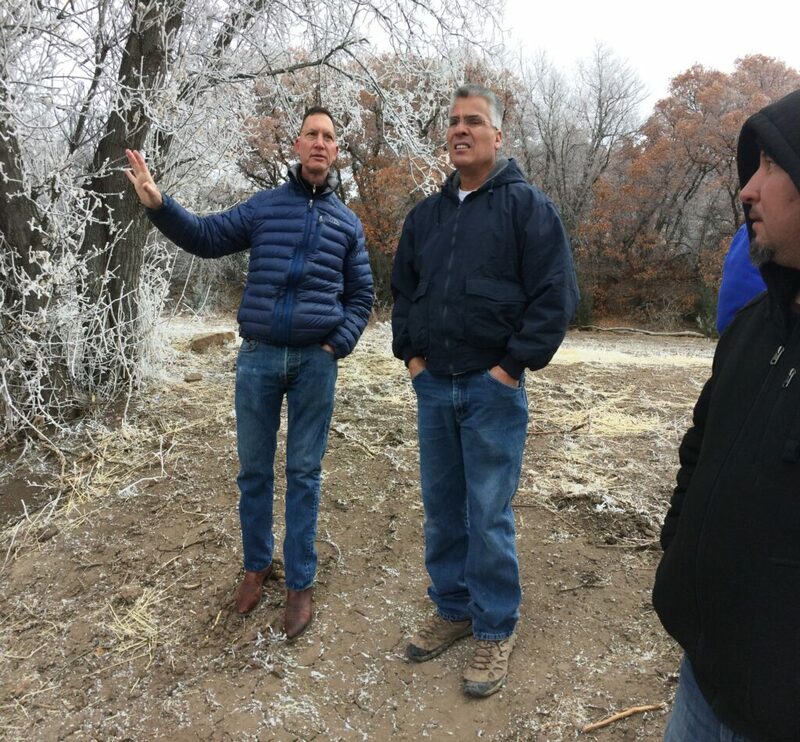 Additionally, we talked about the structures used to reduce the erosion effects during high water events and the enhancement of riparian habitat and floodplain development to minimize the amount of sediment loss. 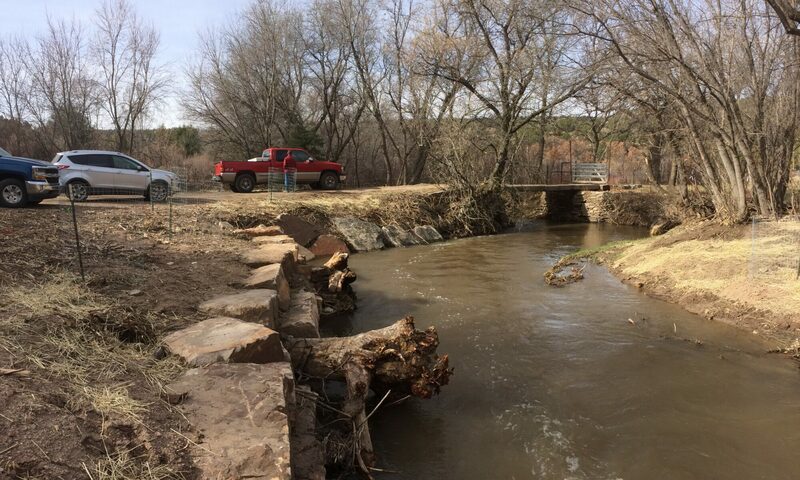 One of the key problems that was identified during the scoping meeting last year was the severe erosion in the vicinity of a 50 yard stretch of their local acequia. 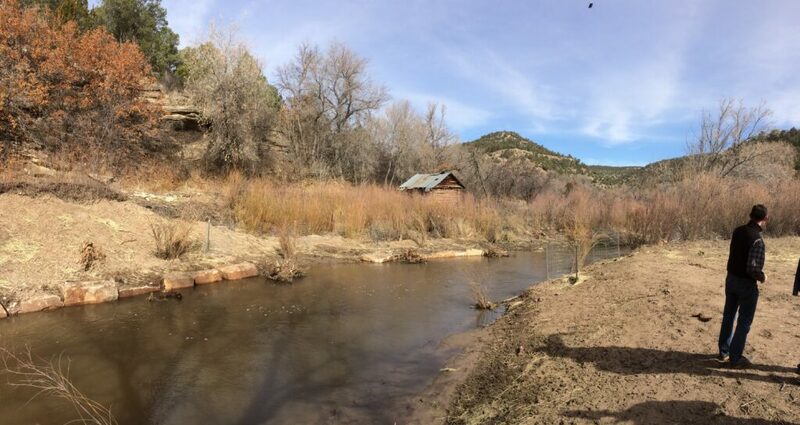 Had this project not been done, the acequia at this location would have ultimately been damaged. North San Ysidro Acequia Segura at Lower Cow Creek. Erosion damage that is impacting the ditch integrity. 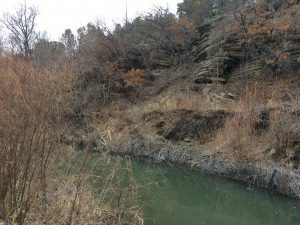 Funding for the Pecos Canyon State Park is under review during the current 2019 legislative session. Team assignments (or form your own), safety briefing, clean up supplies. Free bucket raffle, door prizes for: Most trash collected; Largest team; Most interesting treasure found; Oldest piece of trash. 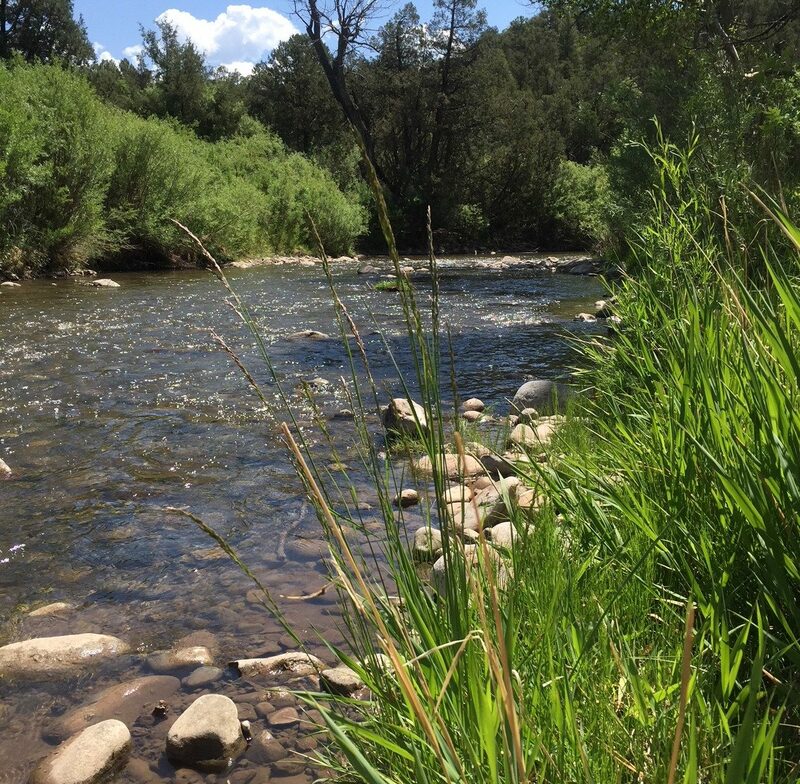 Truchas Chapter Trout Unlimited will provide fly tying demonstrations, fly casting assistance, and aquatic insect education. 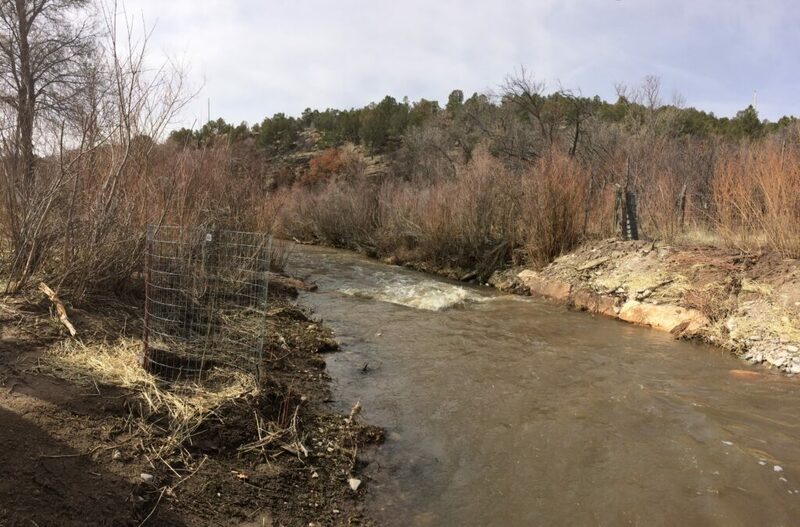 The Upper Pecos Watershed Association’s Clean Water Act 319 (h) on the ground project is nearing the construction phase with the completion of the Biological Survey report and the Cultural Resource Survey report. 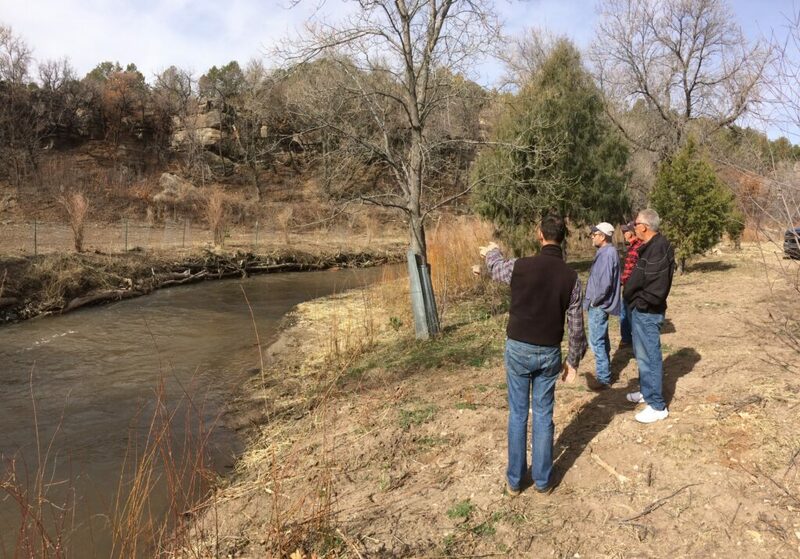 For more details about the Lower Cow Creek project you’re invited to review the project page. We are pleased to announce that the US Forest Service Dalton Day Area gates have been opened and the picnic area is officially open to the public. For the past few years Forest Service budget issues have not provided for staff to clean this picnic area. 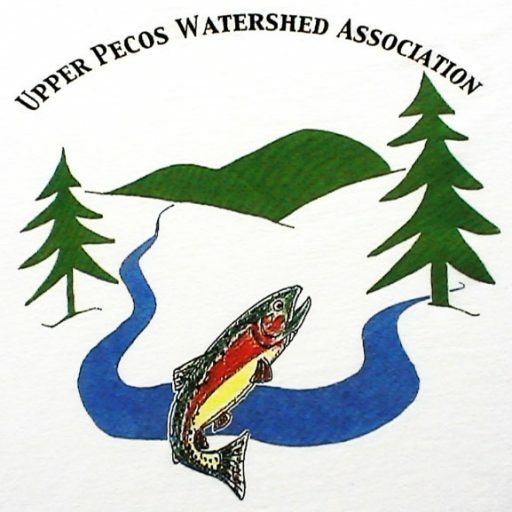 Due to its popularity to the public, the Upper Pecos Watershed Association (UPWA) has committed to a multi-year volunteer agreement with the Forest Service to maintain the cleanliness of the Dalton Day Area. On a weekly basis, while the gates are open, UPWA volunteers clean litter and trash in and around the river. Additionally, UPWA will install portable toilets in the Day Use Area during peak use months. We would love you to join us in our weekly Friday morning trash pick ups. Watch our Facebook events for clean up times. Pecos National Historical Park will offer a ranger-guided hike to the site of the Forked Lightning Pueblo on Sunday, September 9th. 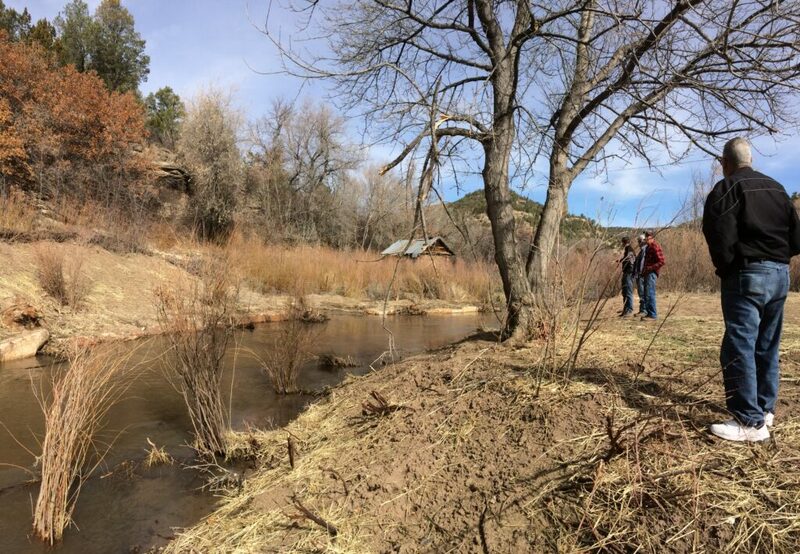 Along the two mile roundtrip backcountry hike to the remnants of this 13th century pueblo, you will explore the fascinating history of this large settlement that sits on the western bank of Glorieta Creek. The pueblo, which housed hundreds of people primarily between 1225 and 1300 AD, was described and mapped by noted archaeologist A.V. Kidder in the late 1920s. Much has been learned about this historical treasure since then—come see for yourself! 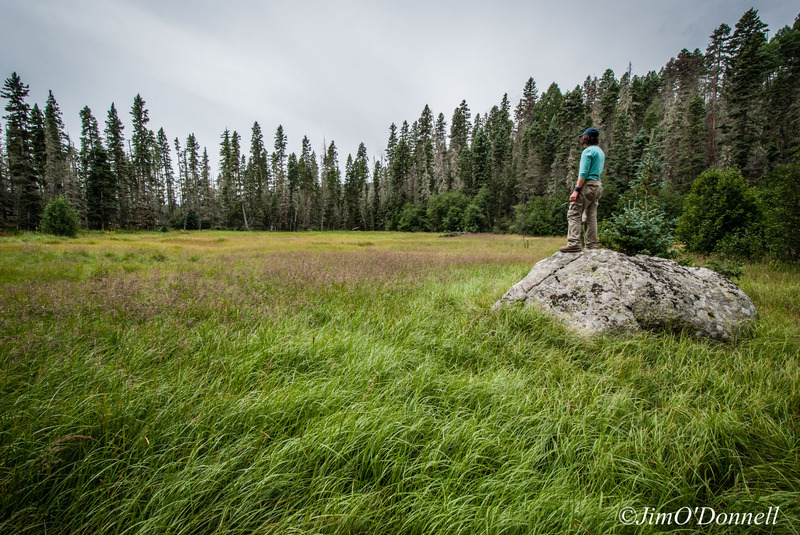 This 2.5 hour program is an off-trail hike along uneven terrain through areas frequented by snakes. Visitors interested in the tour must reserve a spot, as space is limited to 20 participants. Attendees will meet at 8:30 a.m. in the Upper Parking Lot adjacent to the ruins of the mission church. For more information and to make reservations, contact Pecos NHP at (505) 757-7241. You will also find our listings on the New Mexico True website ( newmexico.org) and Tourism Santa Fe ( santafe.org). Please like us on Facebook at https://www.facebook.com/PecosNHPnps or Instagram ( https://www.instagram.com/pecos_nps). 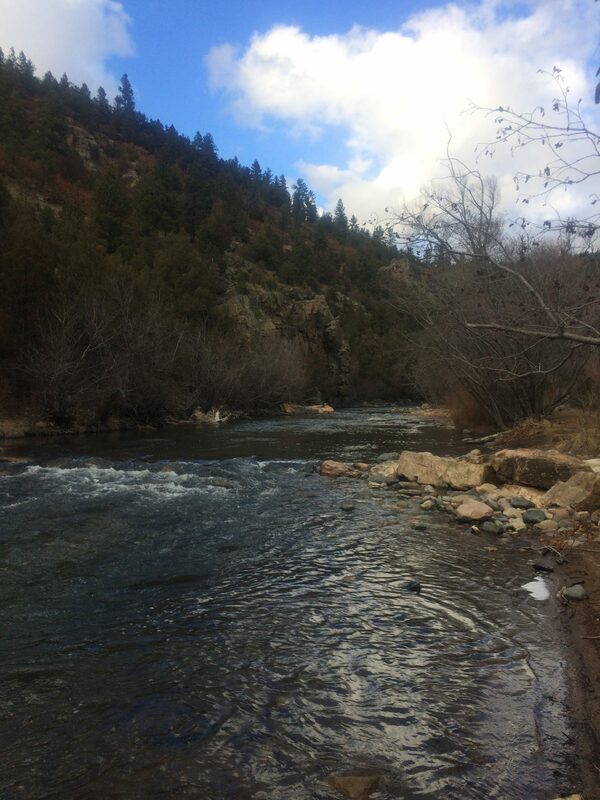 Beginning August 14th, 2018, Pecos National Historical Park will offer fall fishing permits for the Pecos River within the park boundaries. The 2018 fall fishing season will begin September 13th and end November 5th. 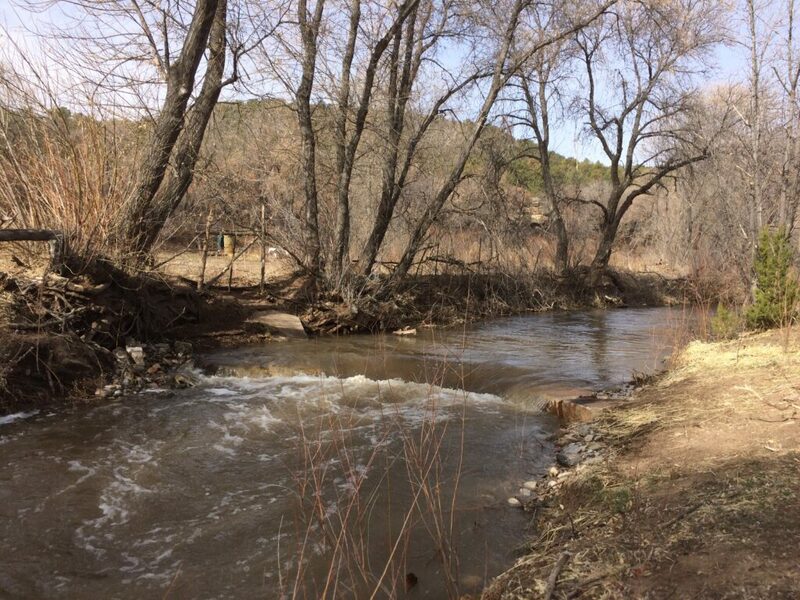 For the 2018 fall fishing season, Pecos National Historical Park will be using an online reservation system. Reservations can be made up to 30 days in advance via www.recreation.gov or by calling 1-877-444-6777. A $15 per day fee must be paid online during the online reservation process. Please note that anglers are still required to check in and acquire a special use permit at the park visitor center prior to fishing. For more information related to fishing, visit the park website https://www.nps.gov/peco/planyourvisit/fishing.htm. 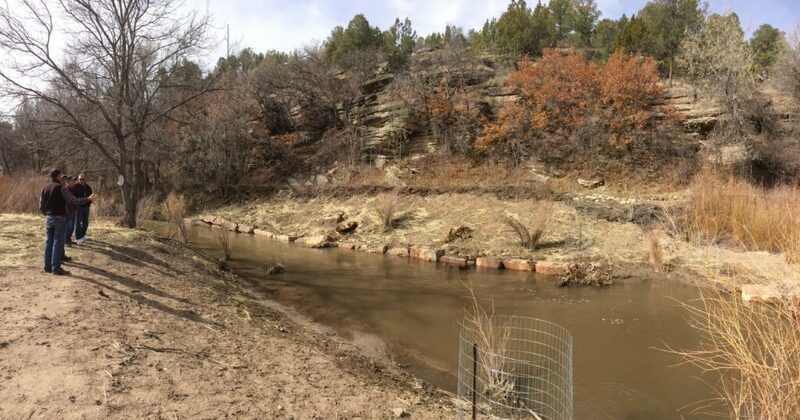 Within the park, three miles of the Pecos River are divided into three sections or “beats.” This approach offers anglers roughly one mile on the Pecos River to fish with up to two other people for the day. 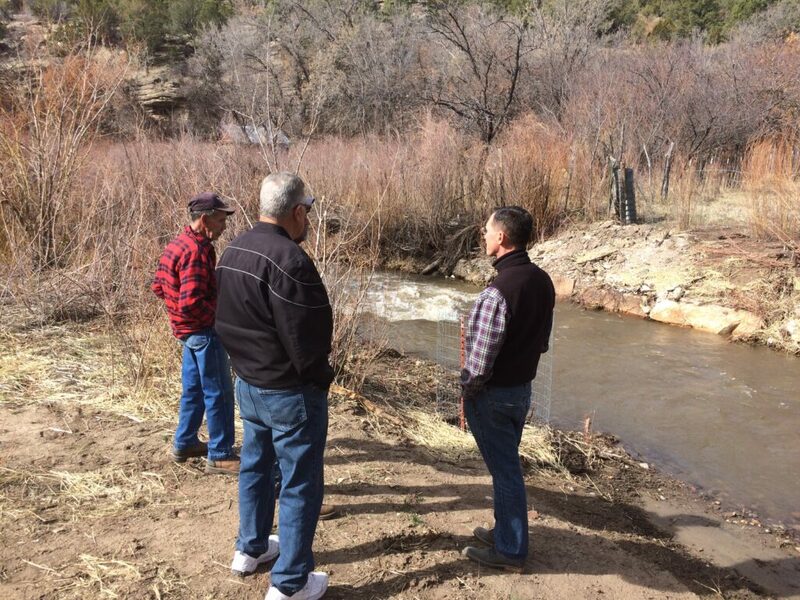 Three beats (for up to nine anglers per day) are available on the reservation system. For more information about the park in general, contact Pecos NHP at (505) 757-7241 or visit our website at www.nps.gov/peco. You will also find our listings on the New Mexico True website (newmexico.org) and Tourism Santa Fe (santafe.org). Please like on us on Facebook at https://www.facebook.com/PecosNHPnps orInstagram (https://www.instagram.com/pecos_nps). 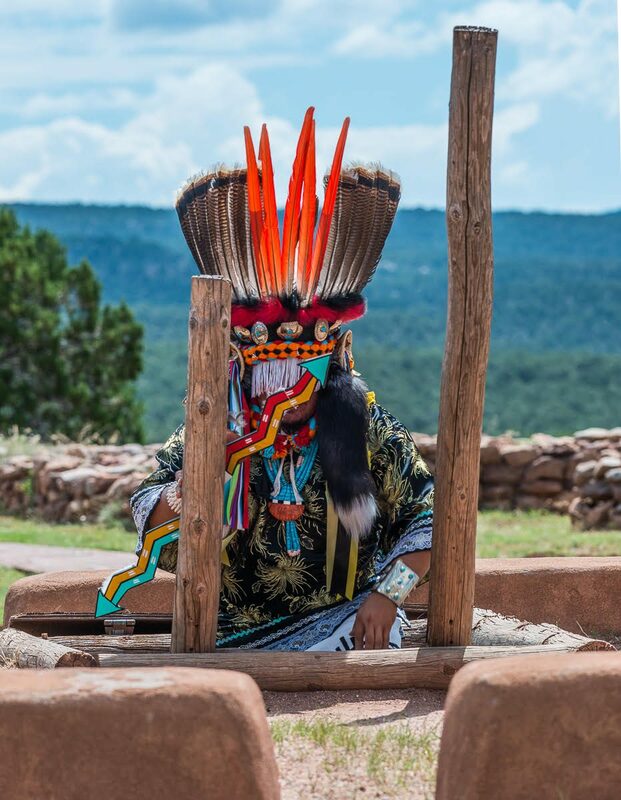 Pecos National Historical Park will host the annual Feast Day celebration at Pecos Pueblo on Sunday, August 5th. Join in a time honored tradition as community members from the Pueblo of Jemez and Pecos celebrate Feast Day mass inside the ruins of Our Lady of the Angels of Porciúncula (Nuestra Señora de los Ángeles de Porciúncula). Following the 9:30 a.m. mass, the Feast Day celebration continues with traditional dancers from the Pueblo of Jemez and fresh rolls from the horno. 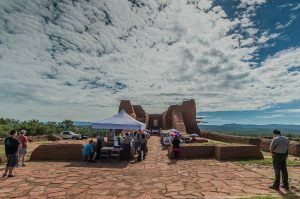 Feast Day at Pecos Pueblo represents the fulfillment of a long-standing promise. Before leaving Pecos Pueblo in 1838, the last inhabitants of Pecos Pueblo entrusted a special painting to St. Anthony’s Parish. A symbol of the pueblo’s adoption of Christianity as another form of religion, this portrait depicts the patron saint bestowed upon the Mission of Pecos in the 1620s. Every August, Pecos village fulfills its promise to perpetually honor the saint by celebrating a feast day mass in the remains of her final church. For more information contact Pecos NHP at (505) 757-7241 or visit www.nps.gov/peco. 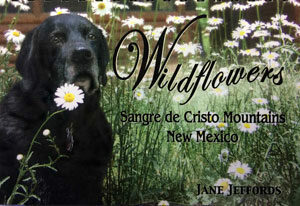 You will also find our listings on the New Mexico True website (newmexico.org) and Tourism Santa Fe (santafe.org). Please like us on Facebook athttps://www.facebook.com/PecosNHPnps or Instagram (https://www.instagram.com/pecos_nps).